Our annual scenic 27km paddle down the Grand River from Cayuga to Dunnville. This is NOT a race, but an adventure that is very fitting to the Rusty Dragons. This special event includes a pot-luck lunch and bonfire stop about two-thirds the way down the river. Car-pooling will be arranged. Everyone is encouraged to steer our boat at some point on the river. Two seats in the boat will be used to store food and gear for our paddlers, hence the limit of 16 paddlers plus 1 steer and 1 drummer (drummer will be changed up so each paddlers gets a turn to sit on the drum for a rest and to view the scenery). As is our tradition, we will likely have an optional dinner planned at Emma's Back Porch afterwards in Burlington. Cost: $40 Payable in cash (in person), cheque ("Rusty Dragons Adventures"), PayPal ("Buy This" button above), Interac e-mail transfer (to "Payments@RustyDragons.ca"), etc. 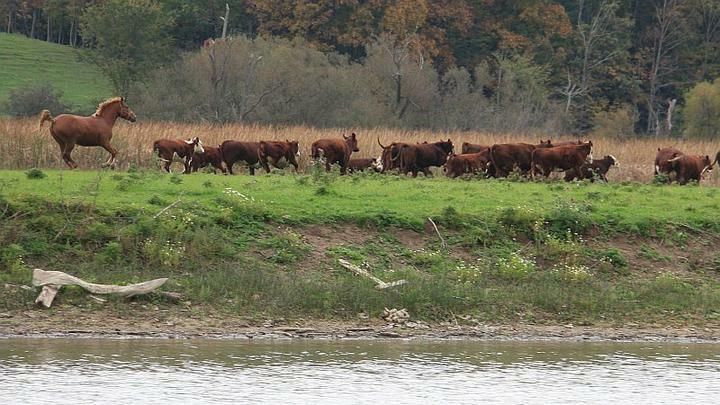 Click HERE to see some pictures from our 2014 River Run. We also posted pictures on Facebook. Click HERE to see some pictures from our 2013 event. Boats will launch from Cayuga at 10am and will stop for an hour at ~12:15pm at the 17km mark for a pot-luck lunch and bonfire. 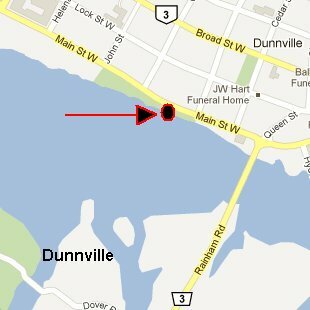 We should reach Dunnville after 3pm. We coordinate vehicles so half are at the end-point and can drive paddlers back to the start-point to get other half of cars. Our traditional AFTER-PADDLE dinner will also be arranged for 5:30pm at Emma's Backporch, where the Rusty Dragons have gone before for food and drink. The address is 2084 Old Lakeshore Road, Burlington. The large-scale satelite map on the far left shows southern Ontario between Lake Ontario and Lake Erie. Hamilton and the Burlington Skyway can be seen at the top left. 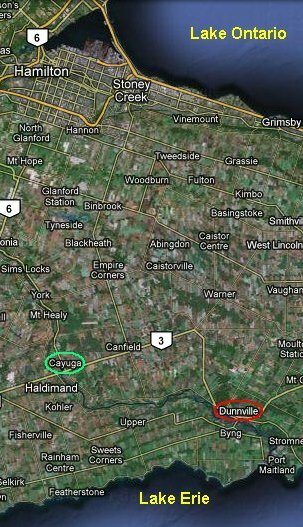 The Grand River can be seen heading towards Lake Erie where it passes Cayuga (green circle) and further downstream Dunnville (red circle) which is 27km down the winding river. 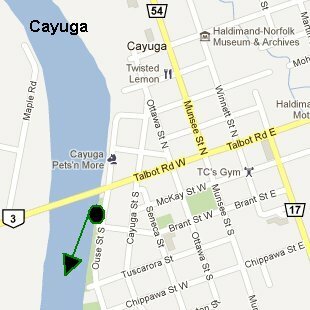 At left is a street map showing out launch point in Cayuga, and below is a street map showing our destination. Cars will be parked at both ends. ABOVE: One of many views from the river along our route (Tim took this picture on a previous River Run). Latest News (May 12th): Registration is now open for this river paddling adventure which has been moved from early October (in past years) to late August (in warmer weather this year!). The team is limited to 16 paddlers, and anyone wanting to get in some steering experience is especially welcome to this event as the wide river and long paddle provide plenty of opportunity for safe and stress free steering experience.